If you ever want to learn new BJJ techniques or BJJ concepts, check out Steve’s site! 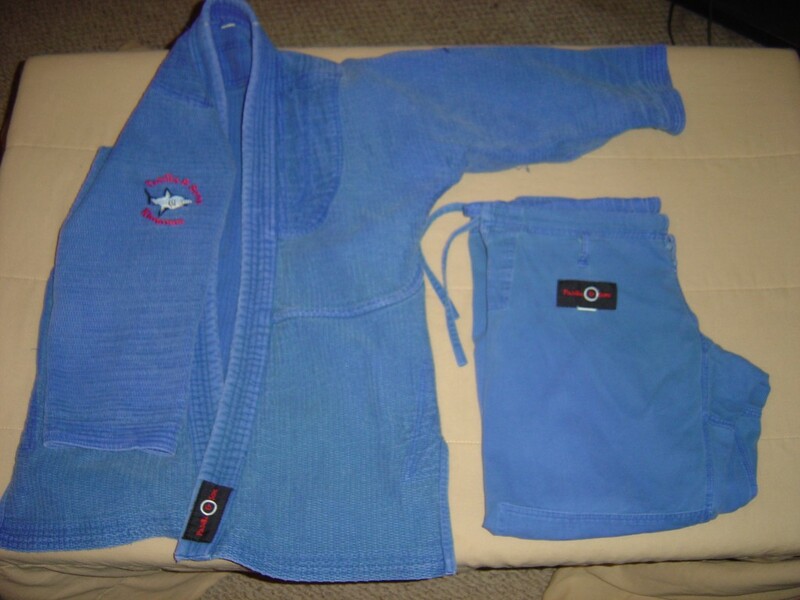 I needed a standby gi for when my “favorite” gis were dirty, wet, both, or in the wash. Of course I took to the internet and on one of the main grappling forums, a poster had started a discussion about the high quality gis being sent out by Padilla & Sons. He mentioned the awesome pricing for a gi of this quality while also bringing up the outstanding customer service he had received. He wrote how he had some questions about his gi, called the number, and basically Mrs. Padilla answered. He said she hooked him up and solved his issues quickly. So I checked them out. Find other gold weave gis available at Amazon! 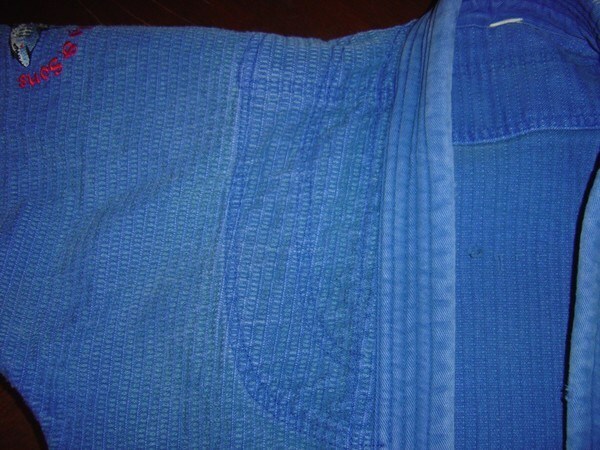 I was looking for an economical gi that was both durable and usable for every day rolling. I also wanted a gi with a bit of color or decoration too. I’m for sure not a skulls and flames guy but I’m also not a guy that likes those plain white karate gis from the 80’s either. I read up on their gis and because of the reputation and low price, I chose the blue gold weave. This gi quickly stepped up into the main rotation and became a favorite as well! Disclosure: I bought this gi several months ago and it is still holding up well.ÿ I just went and checked out the current pricing over at P&S and they have gone up slightly.ÿ For the quality however, the pricing (about $100) is still well worth it. First thought when I opened the package?ÿ Damn – that is blue!ÿ Before this gi, I only had white and black ones, this was my first blue.ÿ Upon taking it out of the package for the first time, I liked the way it looked.ÿ All nice and fresh.ÿ I will say that the jacket did seem a tad rougher than other jackets but of course that went away with washing. Padilla & Sons have kind of a minimal website – their business is making quality gis not running websites so some of the pics were not so high quality and they didn’t have too many. So it was kind of a surprise as to how the gi looked exactly. And I was pleased. Unfortunately I’m going to have to give the P&S gold weave just an above average fit. The pants fit great, it’s just the jacket is a bit too narrow across the shoulders and the sleeves are a tad too short. HOWEVER – I will take full blame for the sleeves as I do not know if it was because of the initial washing I did on the gi. I was not paying attention to the pre-shrinking requirements so I may have overdone it. I will also add that as the fabric relaxes from training, heat, or sweating, the sleeves become fine. It’s just initially they are too short. For comparison purposes, I’m 5’8″ 155, and have an athletic build. I went with an A-2. The design is where the P&S gi shines I believe. It’s nothing fancy – just well made. Double stitching on all seams and it has a seamless back. Stress patches on the knees, hips, and jacket skirt as well as along the collar and in the armpits. The jacket is almost a tank man. It just looks stout. If gis lifted weights, the P&S gold weave would be the guy doing squats. For the logos, I like them and I don’t. The logos are minimal, I wish they would have had a bit more, there are like 3 on the jacket and 1 on the pants. 2 of those are the P&S patch, the other 2 are embroidered sharks on the jacket biceps. I like having a shark but the one on the left sleeve seems kind of random. It’s just a shark sitting there. 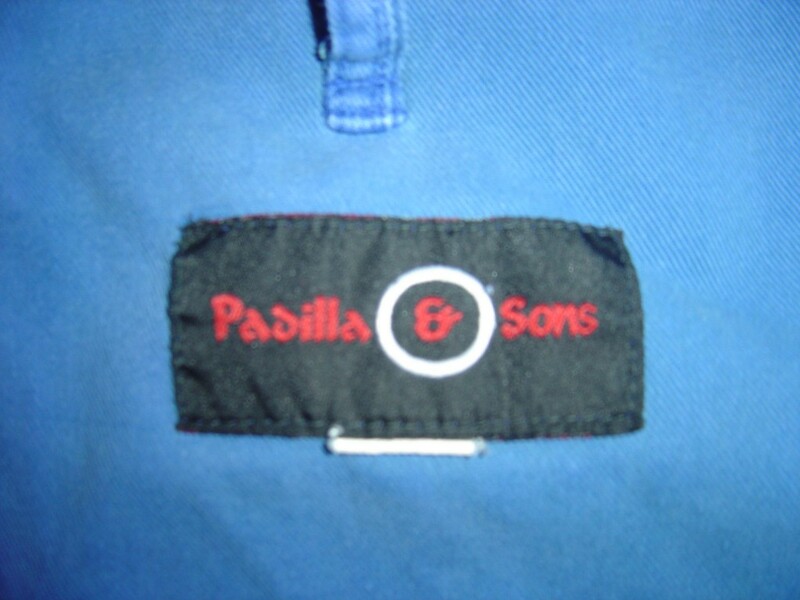 The right sleeve has a cooler shark surrounded by the words Padilla & Sons Kimonos. That one is cool. Want a lightweight gi? Check out the best Gis at Hypnotik! Again, the jacket is stout. It has reinforcements around the collar, around the cuts on the skirt, as well as the armpits. The length of the jacket skirt is just right and they put like a cloth reinforcement patch all along the skirt seam, double stitched. 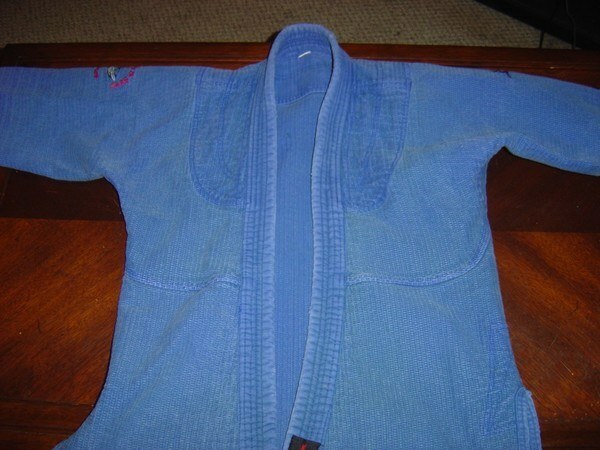 The collar on this gi is awesome, it is one of my favorites from all of my gis. It is hard to manipulate but not in that too rigid kind of way. You can tell when you grab it that the threat of chokes is a bit removed while wearing this top. It’s just beefy, too beefy to use against you. The collar is a definite plus. The one drawback to this gi jacket is the sleeve length but like I wrote above, I could’ve caused this by trying to shrink it too much. 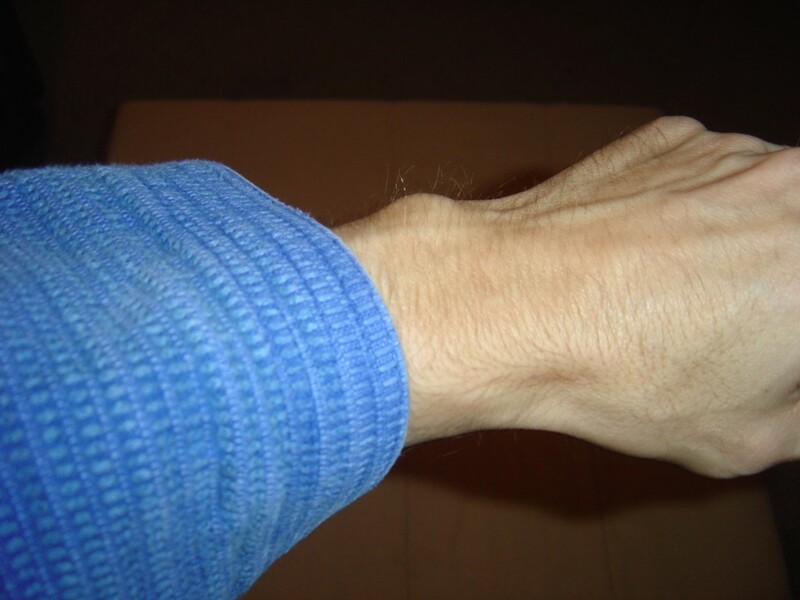 Until I’m warmed up the sleeves stop just behind my wrists, like where a watch would be. This also can be advantageous as your opponent will have a hard time getting his grips on your sleeves. I absolutely love these gi pants. Well I guess I should take that back, I like almost all aspects of the pants that came with the gold weave.ÿ I like the material its made from as well as the feel of the fabric. The pants are sturdy and durable but the gold weave allows it to breathe which means you stay cooler. The pants are not made from some of the rougher, more stiff fabric you see with some gis. The length is perfect too. I would much rather have pants with proper cuff length than a gi jacket with proper sleeve length. These pants are just plain old comfy. There are reinforcement patches on the high stress areas too on these pants. The P&S gold weave gi has these on both knees as well as at both hips where the drawstring passes through. 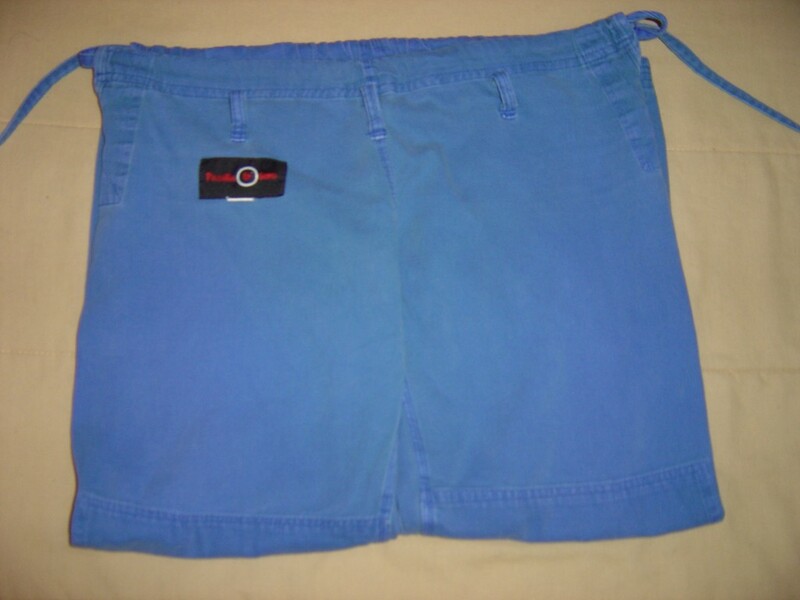 The pants have a drawstring rather than a rope and 3 loops for you to tie it through which is a nice touch. It gives you an anchor point right in the middle to tie your knot or pretty little bow. But this is also the reason why I took back my love the pants comment. 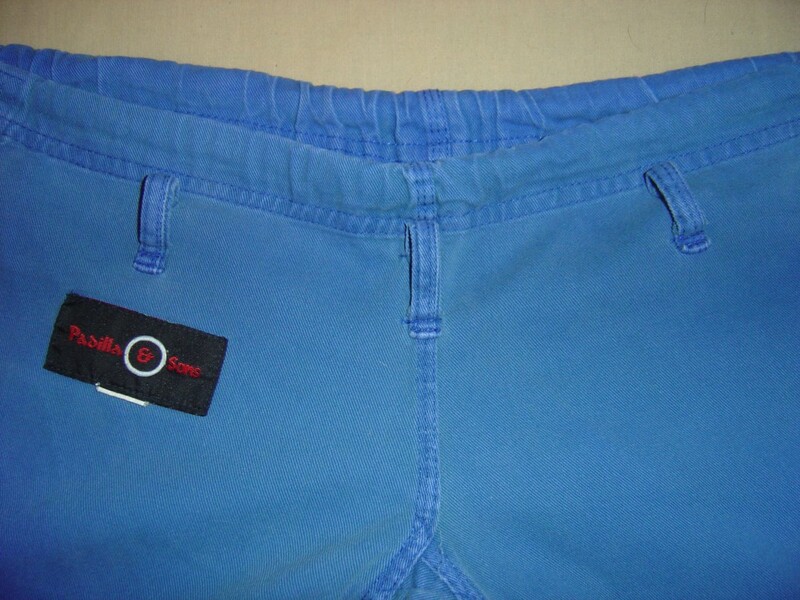 It seems like until you are warmed up and have a little sweat going, these pants in particular need a lot of adjusting and re-tieing. Once you find that knot sweet spot though, these pants are golden. This gi performs really well out on the mats. Since it’s a gold weave it allows the fabric to breathe much more than a single weave would. The back is seamless and of a one piece design so you don’t roll over it with your spine. The jacket is well built and aside from those little tears you get with use on the collar, it has held up exceptionally well. Also, the jacket is so beefy that opponents will have a hard time using it against you.ÿ The pants though make for some killer grips around the ankles because it is so soft so be aware of that. The Padilla & Sons gi is probably one of the best gis on the bjj market due to its durability, price, and reputation. I would recommend this gi to anyone who is looking to have a gi that is fundamentally sound, very durable, not too flashy, and is basically looking to put their money into something that will last out on the mats. This gi isn’t coming apart anytime soon. Right around $100, you are going to be hard pressed to find a standard gold weave gi that outperforms this one. The gi jacket is pretty good and I’d rate it highly. The collar is off the charts and so is all of the double stitching and reinforcements. The pants are the bees knees. They fit well and are still going strong after countless rolling sessions, no rips or tears, no holes. And if you ever need customer service, Mrs. Padilla is a phone call away! 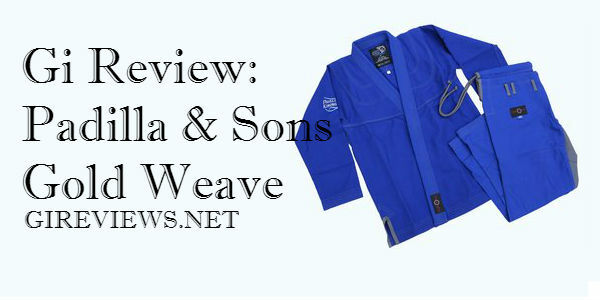 You can get your very own Padilla & Sons Gold Weave Kimono here. Or you can head on to Amazon and check gold weave gis from other leading brands!